I made a fruity salsa with mango, pineapple and watermelon. I made this last week and I had it with salmon and potatoes. The best thing about salsas is that you can put them together in a jiffy. 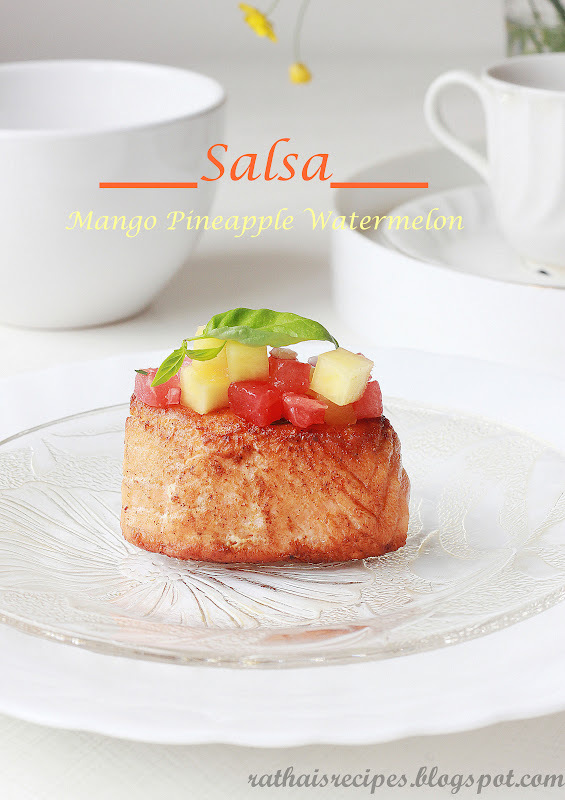 This fruit salsa made for a juicy and refreshing sidedish to the warm, mildly-seasoned salmon and the cold potatoes. The watermelon was kind of a last minute impulse and the watermelon made the salsa more sweet than your average mango salsa. If that isn't your thing, I think the best option is to omit it completely or replace the watermelon with tomatoes. Peel and dice the pineapple, mango and watermelon and place in a large bowl. Slit the serrano pepper into two with a knife and carefully remove the seeds (and the white stem, if desired) with a knife and chop the pepper into small pieces. Try not to touch the seeds with your fingers when removing them from the pepper because you'll feel a burning sensation in you finger tips for hours after that. Add the chopped peppers to the bowl with the fruits. Finely chop the onion and the cilantro (coriander) and add to the large bowl with the diced fruits and toss or mix all the ingredients. Season with salt and lime juice, mix. Serve with fish, grilled chicken, or barbeque. It's also tasty to eat just the way it is! Salsa är verkligen så gott, mums och din ser så god och fräsch ut. Ananas ska jag testa framöver. Du såg att jag gjort med passionsfrukt, det blir riktigt gott med kombon mango/passionsfrukt. You are right, the bowl is empty now, Mahi. :) But I always take plenty of pictures so I have some of the bowl as well (I didn't upload because I couldn't decide which ones to upload), so I'll send one. You're right - salsa are so easy to throw together and one can be quite creative like the one you've made here! I love the addition of the watermelon. Not something you see in salsas much, and why not? Now that I see it, it makes sense. 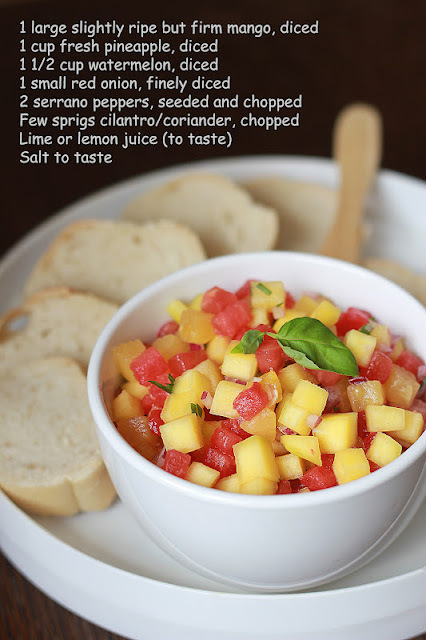 This salsa is perfect and I bet it was delicious with salmon! Beautiful picture and what a great idea! Thanks for adding photo Rathai! :) Salsa looks colorful n crunchy! i don't think anyone can ever go wrong with a salsa. there are so many variations and they all taste unique! Tack fina för din kommentar inne hos mig. Allt bra med dig/er? Hoppas solen skiner lite på er... här har det regnat men nu så skiner solen, kram! Perfect! I am organizing a mini-grill party next weekend. This pairs really well with grilled chicken and grilled pork, sliders and grilled burgers. The happy mix of colors will liven up my party, I bet. Thanks! How are you Rathai?! What happened to your Almond cookie post?! Its been a real LONG time.